Fortunately for the collector, Josiah Wedgwood was the first potter of note to mark his goods with his own name. Unlike the easily copied potters marks used by other manufacturers, for example the crossed swords mark used by Meissen; the Sevres double L mark, or the Chelsea anchor mark. Before 1781 very few unmarked pieces can be correctly attributed to Wedgwood. There are also some interesting pieces around that are marked with USA Patent dates and details. A rare mark. Used on the bell works. A circle mark without rims. This mark includes the word, ‘Etruria’ and it was impressed inside the bottom of an old Basalt vase. Having lines inside and outside, the mark was impressed on Basalt or Etruria vases, but not seen on Jasper ware. This mark was used on intaglios and 356 is the number of Wedgwood and Bentley catalog. W & B and a catalog number were used on very small intaglios. A rare mark found on plaques and ornamental wares. The addition of Etruria is rare. There are various sizes. Found on busts, granites, Basalt vases, figurines, plaques, medallions, and cameos. and for a while after the death of Josiah (1795). A rare impressed mark, WEDGWOOD & SONS, used for just a short time. The date indicates the first registration date of the design in 1805. “2nd Feby” was sometimes used instead of “Feb. 2”. Found on tripod incense burners. Found on bone china or earthenware printed in red, blue, or gold. Impressed directly in the bodies of Queens ware or printed in colour. From 1860 used with a three digit date code (see year cyphers) ‘England’ added in 1891. For a short period. Found on high-quality goods. ENGLAND was added to the Wedgwood mark in 1891, to meet the requirements of the U.S. customs regulation know as the “McKinley Customs Administrative Act”. Printed mark on creamwares and Queens ware in colour. The ® denoting a registered brand name. The pattern name or number may also be shown. The ® denoting a registerd brand name. mid-1998 onwards Note the Portland vase designed within the W.
The standard impressed WEDGWOOD mark occurs on all items that include the three letter code. The table below shows the year associated with each third letter in the group of three. The impressed letters first appeared in 1860 with the year letter ‘O’. From 1886 to 1897 the first 12 characters were re-used. After 1891 ENGLAND will appear with the mark. 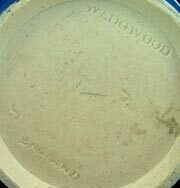 Again from 1898 the letters A to I are re-used but are easy to differentiate as they also have ENGLAND within the Wedgwood marks. Wedgwood Antique Pottery and Porcelain for Sale … You can find great deals on Wedgwood Jasperware, Queens Ware and Fairyland Lustre at local Antique Auctions listed in our Antique Auctions finder (soon to be launched).